Image taken from the May, 1946 issue of “Road Builder’s News” published by the American Road Builders’ Association. 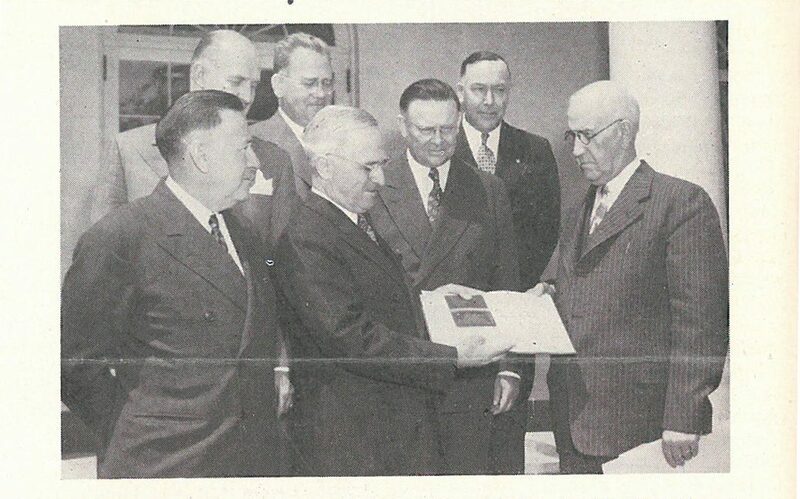 President Harry S. Truman received an honorary lifetime membership from the American Road Builders’ Association, forerunner of today’s ARTBA, 70 years ago this month. ARBA Chairman James J. Skelly, with other association officials and Rep. J. W. Robinson, (D-Utah), chairman of the House Roads Committee, presented the president with the lifetime membership on May 7, 1946. “A gold membership card in a pigskin case and an engrossed parchment bound in blue leather were presented to him in appreciation of his activity and interest in local and national highways,” the “Road Builder’s News,” reported at the time. Truman died in 1972. A small plaque in the lobby of the ARTBA Building recalls the day that the man from Missouri received the honor.